Welcome to a modern take on living. Welcome to the chic lifestyle that dreams are made of. 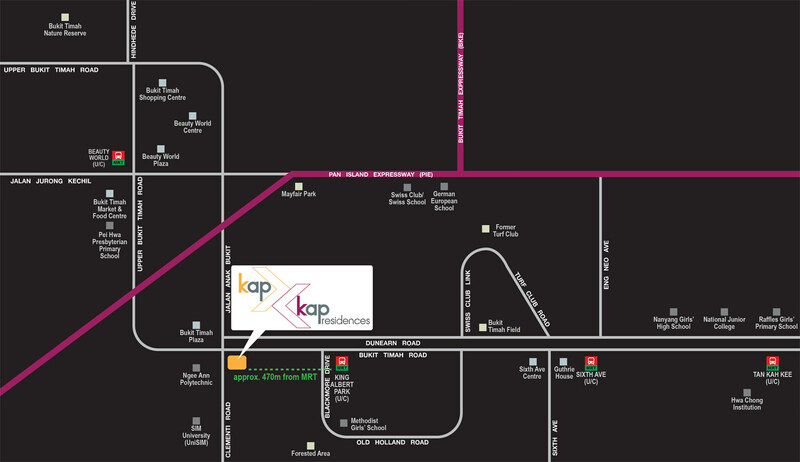 kap & kap residences puts you in the heart of the action with a prime location in one of Singapore's most sought after districts. With an address that will make you the envy of family and friends, you will never be far from what you desire. Drivers can easily zip around town with both the Pan Island Expressway and the Bukit Timah Expressway just a short drive away. The upcoming King Albert Park MRT Station is less than half a kilometre away from kap residences, connecting you to Singapore's compre- hensive transportation network. From kap residences, the whole of Singapore is your playground. While every reasonable care has been taken in preparing this brochure, the vendor and its agent(s) shall not be held responsible for any inaccuracies or omissions. All statements are believed to be correct but shall not be relied on as representations of fact. Rendering, digital images and illustrations are artist's impressions only and cannot be regarded as representations of fact. Photographs cannot be regarded as representations of the as-built standard specifications and facilities. All plans, internal layouts, information and specification are subject to change and shall not form part of an offer or contract. The vendor reserves the right to modify any part or parts of the building, housing project, development and or any unit prior to completion as directed or approved by the building authority. All plans are subjected to any amendments approved by the relevant authority. The floor areas and the breakdowns of the unit floor areas as indicated in the sales brochure are approximate only. Unit floor areas are subject to final survey.